Our dog training classes are designed to accommodate your needs. Many of our courses are ongoing and you can join at any time. This means weekly attendance, although recommended, is not mandatory; if you miss a week or two, you can come back and pick it up exactly from where you stopped, without falling behind. Advancement to the next level is based on completion of a task sheet. We are here to provide you and your dog with quality instruction in a flexible, supportive and low pressure learning environment. We think this is the most important class your puppy will ever attend! 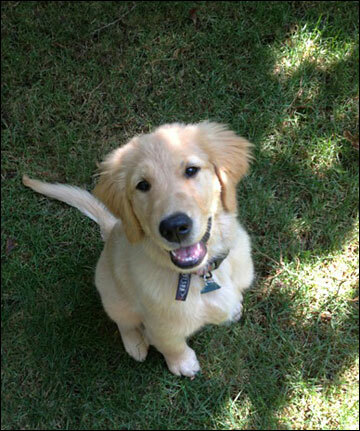 We introduce basic obedience skills including coming when called, greeting without jumping, leave it, and leash walking. We also discuss puppy challenges such as house training, nipping, and more! Puppies benefit from intensive socialization by positively interacting with a variety of people, dogs, and novel equipment. Is your puppy no longer just a puppy but instead has grown into an adolescent puppy? Congratulations! And ... hang in there! At this age, training remains vitally important to ensuring your puppy grows into a well-trained and content dog. Dogs at this age are highly excitable and their self-control is only beginning to develop. At this age, we strongly recommend enrolling your dog in Puppy First Grade. We work outdoors to strengthen your dog's obedience skills in a more challenging, real-life environment. These skills include loose leash walking, coming when distracted and "leave it" exercises. Additionally, we will begin to work towards your Canine Good Citizen title. This AKC certification is the first step towards becoming a therapy dog and allows your to show off your dog's good manners. This class is for dogs 6 months or older that have completed an introductory training class. Sundays 11 am-12pm. Meets at the park at 50th and Dorchester. This class is for all dogs over 5 months old. Saturdays 1:30-2:30pm. Meets in the basement at St. Paul and the Redeemer. Dogs and Humans agree that Agility Class is very fun but it also is a great place to work on off-leash control in an environment full of distractions. Once you have the basics of obedience down, you are ready to enroll in our Agility class. This class is also great for building confidence in dogs that are less than enthusiastic about tackling agility obstacles. You can continue your agility training by practicing new courses and handling techniques each week. BEGINNING AGILITY: Fridays 10:30-11:30am. Meets at a tennis court near Jackson Bark, behind the Museum of Science and Industry. Wednesdays 6:30pm - 7:45pm. Meets in the basement of St. Paul and the Redeemer. We will go through Sue Ailsby's Levels of Obedience, introducing your dog to increasingly difficult cues and tricks. Ailsby says, "When you've completed Level One you are starting to see that you can communicate with your dog. A Level Three dog has most of the skills he'll need to make a great pet. More to the point, you'll have the skills you need to teach him any further skills specific to your own household." Your dog will also be introduced to the equipment used in our Agility courses and gain familiarity with the Agility obstacles. This class can also prepare your dog to take (and pass!) the Canine Good Citizen Test (which is written by the American Kennel Club, an explanation of which can be found here). This new and exciting sport develops a dog's natural scenting abilities to search and locate hidden odors, just like police detection dogs - except we don't use drugs! In addition to being fun, this class builds your dog's confidence and strengthens their focus while amazing you with their talent. This mentally challenging sport is perfect for ALL types of canines, regardless of breed, age, or physical condition. Please email for availability, class dates and times. Do you need help with your dog at YOUR house or in YOUR neighborhood? In Pup Crawl, class members (human only) visit each other's homes or neighborhood to work on the challenges you are experiencing there. These could include barking at people who walk past your yard, problems when guests visit including jumping on guests, begging from guests at the table, barking or pawing guests if they do not give your dog non-stop attention or threatening every new person who visits your home. Perhaps your dog exhibits undesirable behavior on walks when you see skateboards, suitcases, children or men! Whether your dog is too friendly or not friendly enough, all are welcome in this class. This is a great compromise between group classes and private lessons that will provide in-home training that is focused on your individual needs. Class is restricted to people who can meet in the Hyde Park area. Dates and Times based on your needs. Frustrated by your dog's outdoor manners? Does your dog dash after squirrels, pull to other dogs, or eat garbage? Does your dog bark at dogs, people, bikes, skateboards, or trucks? This outdoor manners class is for you! If your dog is strongly reacting to dogs, people or other moving objects even when they are a long ways off, this is a great starter class because the location allows for training at a distance and shortening that distance only when your dog is ready. Sometimes dogs need one-on-one attention from a trainer. We provide Private Lessons in your home or neighborhood. Private Lessons can be arranged when it is convenient for you. We also provide Skype Lessons for those people who are not Hyde Park locals or who are looking for all the benefits of a private trainer without the inconvenience of leaving your home!